Far too often I see important text on our clients’ sites being represented as an image. Good Web development firms stay away from using images for text because they know that Google, Yahoo and other search engines will not index the text; unlike humans, they cannot read text in the form of an image. 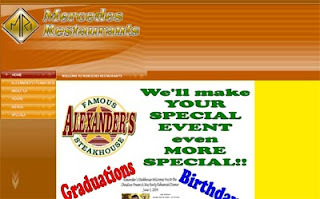 There may be some lost opportunities for search engine optimization here, especially since readers may be searching for keywords like "restaurant" and "special event". 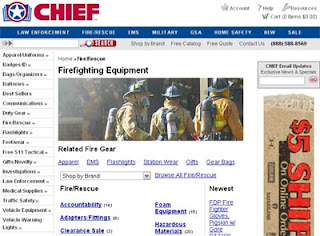 CHIEF, on the other hand, has rendered almost their entire home page as text. We don’t suggest only using text on your Web site. A balancing design using both text and images is important for usability and SEO as well as creating an attractive look and feel with which your visitors connect. However, it can be easy to get carried away with cool graphics and fonts. This can be especially tempting if a designer pitches you a flash-based web site. While flash applications offer many rich graphical and interactive options, search engines often cannot index the text contained in them. Make sure your text doesn’t get lost in images or flash by asking your Web design company about their SEO plans for your site. And if your designer doesn’t want to discuss SEO, you may have another red flag -- stay tuned for more on that topic in the next post in this series. I'm reading: Web design warning signs: #9 - Text rendered as ImagesTweet this!